Are you effectively communicating the benefits of your product or service? Ultimately, the reason you are in business is to help your clients solve a problem. Whether you are part of a small business that helps its clients by repairing their automobiles or you are on a team operating a multi-million dollar company that manufactures medical devices, your clients come to you because they have something they need to accomplish and are counting on you to help them. It’s important to remember to constantly ask yourself these questions when you’re marketing your products or services. “Am I looking at this from my clients’ perspective? And am I conveying the benefits, or end result, of what they will get out of our company’s relationship with them?” Often what happens is business professionals make the mistake of marketing the features of their offerings instead of the benefits. 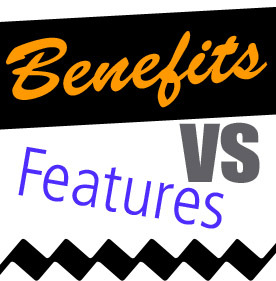 Let’s take a look at the difference between benefits and features. A feature is something your company does or has that allows it to get your clients what they want. For example, a health club may have features like an Olympic-size swimming pool and 50 treadmills. Those are features, not benefits. They are the means to an end but not the end result itself. Now let’s take these features and extract the benefits the health club’s potential clients are really looking for when considering their facility. The swimming pool is ”perfect for tightening and toning every muscle so you look and feel great!” That’s what clients get out of using the pool. So what do they get from using the 50 treadmills? The treadmills are “great for helping you develop stamina and energy for your day… Plus, you’ll never have to wait for a machine!” The benefits are that they “develop stamina and energy” and they save time because they will “never have to wait.” Again, these are two high-value reasons why a prospect would choose this health club. By structuring your marketing campaigns to promote benefits instead of features, you’ll greatly increase the likelihood your message will resonate with your target audience. Marketing the benefits of your products or services helps show you understand what your clients want and that your company is able to provide it for them. Put the benefits of your wares first and foremost in your marketing and you’ll win more business through more effective communication!